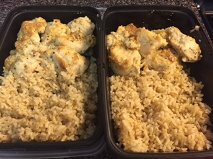 I was meal prepping for the husband today and thought I'd spice up his normal meal of chicken and rice. The chicken came out so juicy and delicious - I had a hard time keeping some for him! 3. In a medium size bowl mix together the yogurt, salt, pepper, garlic, parmesan cheese, and Italian spices. 4. Add chicken and mix until covered. Spread in a single layer in the pan. Top with 1 Tbsp more parmesan cheese. 5. Bake for 40 minutes until browned on top. Serve with rice and vegetables for a complete meal!